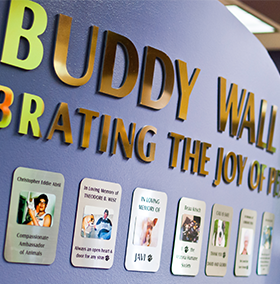 Honor or remember your loved one, human or four-legged, with a custom plaque on the Buddy Wall at our Nina Mason Pulliam Campus for Compassion. Each plaque with personalized inscription serves as an everlasting tribute to your loved one. Once you complete and submit the form below, you will receive a confirmation email with instructions on how to submit your photo. Please email your photo and a copy of your confirmation email to giving@azhumane.org.